Many a child has been known to wait all year to come back to Gan Israel! 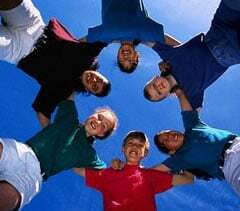 For the summer season, campers between the ages 4-12 will enjoy a wide range of exciting activities and field trips in a warm and vivacious atmosphere. Our picturesque camp site, contain beautiful facilities, well suited to a full program of games, crafts, dramatics and other enriching camp activities. Our experienced staff work to develop skills, confidence and a sense of fair play within each child. Our weekly program is enhanced with choirs, Olympic type games, police and fire demonstrations, drama, carnivals, dress-up days, overnights, color war, hiking, bunk competition, Shabbos parties, Challah baking, and .. oh... so much more. Under the direction of our experienced crafts director, campers will have the opportunity to design and take home some wonderful Judaica projects.